These 50s One Note Samba Pumps will make you do a happy dance! Dancing Days By Banned did it again... admit it, you can't say no to these beauties? 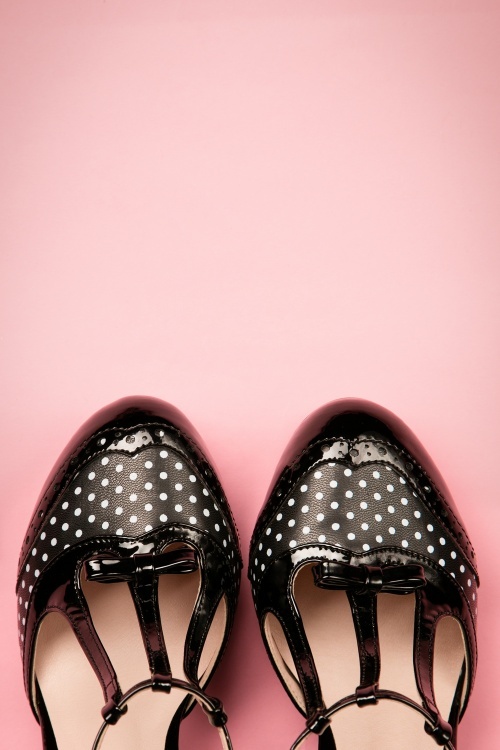 They look super sassy thanks to the black lacquer, the wonderful white polkadots, the adorable bow, the typical vintage style T-straps and have a platform, making them not as high as they seem to be. If you could frame them you would. And when you put them on, don't forget to take a moment to enjoy the super comfy foot bed. Made from a high quality black faux leather and finished off with an outsole with little polkadots and anti-skid ridges. Ready to samba?